Today is the opening day of the National Home Show and Canada Blooms in Toronto, one of the largest home shows in North America. 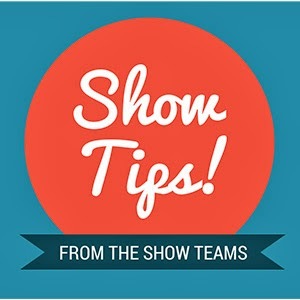 After watching the show teams work incredibly hard during the months leading up to our busy spring home show season, we wanted to share their tips for exhibitors on having a successful show. Also opening today is the brand new Cleveland Home + Remodeling Expo, and the Denver Home Show. Best of luck to all of our show teams and exhibitors -- may all the shows be a great success! It takes 3 seconds to draw someone into your booth! Always keep your eyes open for prospective clients. The bigger the booth, the better the results. Size does matter! Take advantage of all the offerings from show management. Build your online profile, advertise with us and sponsor an item to get your logo in front of more attendees. Utilize the tools Marketplace Events has to get consumers to come directly to see you in your booth. Concentrate on bringing the people to the show to see your booth and specific product offerings. Don't miss the unique opportunity to engage face to face with qualified buyers. At the show, be yourself; friendly and knowledgeable, open the door to increased sales by building relationships one at a time. Have a plan going in and know how you will execute it! Prepare yourself with plenty of marketing materials and be sure to collect leads from the show. This way you will have a qualified list of who to follow up with. The best attire you can ever wear is a SMILE. Be excited, engage and educate people about your business. That's 90% of the game! The remaining 10% it showing them what sets you apart from the rest! Better late than never is not a motto to live by with consumer shows. Avoid hassles and submit forms and other important exhibitor information as early as possible. In the end, this will save you a lot of time and keep you stress free. Create a warm and inviting space. A positive attitude and smile goes a long way! Striking up a conversation about something other than business reflects a genuine interest in your prospective clients. Make every customer feel important and give them your undivided attention without distraction - be genuinely interested in them. And above all, remember the Golden Rule: Do unto others as you would have them do unto you. Home Shows are so much more than just booth space! Yes, your booth is the key component of your marketing strategy with us, but we have additional advertising options from online marketing to post-show research surveys to support your booth space investment. Plus, be sure to ask your sales representative about all the research we’ve already gathered on our consumers to help you better target your products and services at the show. Don't forget to leverage the show's advertising. Taking advantage of opportunities like show guide ads can greatly expand your company's profile during and after the event. It's a super cost-effective way to get your ad in front of a very targeted audience. The visual impact of your booth and signage are possibly the most important aspects of any trade show display. A general rule of thumb for signage? When someone looks at your display, they should be able to tell within four seconds who you are, what you do, and what problem you are solving. Think about traffic flow within your booth. We put a lot of thought into traffic flow within the show but if the visitors can't flow through your booth at the show then your potential impact is decreased. Have lanes and clear paths to entice visitors into your booth so you can engage them. I was amazed! While I was reading your blog, I was thinking how it's possible? How can make a blog so interesting, and informative. You are a very skilled blogger. Carry on your blogging. . I want to share a site on Online Marketing. Please visit my website for more information about Online Marketing . Glad to have these expert tips for the trade expo success. I agree that the presenter should always keep his eyes open for potential clients. Also they must use informative and eye caching trade show displays as they matter a lot to attract clients.